As the Valentine's Day is approaching, I have realized that I have signed up for Sugar Cookies in Abhi's school for V-day party. It is good to have kids, at least they remind some events like these to mommy and daddy in case if they forget. ;-). And also this gives me an opportunity to use my cheap indulgences that I owned from my 'early morning grocery trip'. The minute i think about Sugar cookies there is only one recipe comes to my mind which has been shared by my supervisor's wife a few years ago. She made these cookies for St Patrick's day and I loved them because of their miniature size and taste ( they are not so sweet). She said she uses the same recipe for Vday cookies also, expect she uses small heart shape and said these are called Spritz cookies. Her name is Monica McClellan and today she is recovering from her 10 weeks early delivery and praying for her little son's recovery. I am praying for her little son's recovery and dedicating these cookies to her today, wishing her lots of love, health and joy. Wishing Monica lot of recovery, health and joy of her son's return to home. 1. Place the butter in a medium bowl and heat in the microwave for 1 min. 6. Bake at 400 F for 10 minutes. Watch closely from 8 min, as they can get burnt easily. As I don't have the cookie press I have used my cute little cookie cutters to make the shapes and baked them. Look at all these cute heart shapes. Look at these cutesie cookies. What a fun, when Strawberries becomes cookies? I have added very light red color (to get the pink color) in half the mixture. In other half I have baked as it is so that the kids color and decorate them. 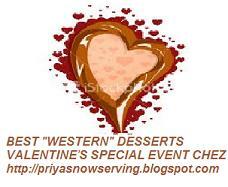 I am sending this entry to Best Western Desserts event at Now Serving. Happy Cooking until next time. Very cute and lovely cookies. Love the shapes. Looks so cute. So cute and lovely, I love the shapes of your cookies. Very cute cookies. Mythreyi. My daughter is insisting I make them NOW! Hi there...first time here...your cookies looks so cute...and nice space u have here. Nice cookies. I love the shapes. Thank you for participating the Smackdown Battle. Best of luck to you. These sugar spritz cookies are so cute and unique. Wonderful choice to submit these cookies for the contest. Really cute and lovely! Your kids would have had a blast! Happy Valentine's day to you!